TripleInt’s Pure Performance based Option Trading Subscription Model. The content is restricted to Subscribers. If you are a new subscriber, Register to access the options trades. New series begins more on a neutral note…A range bound month ?! New July series started with a strong gap up and tested the levels of 5700 before ending the day at 5627, below the expiry value of 5647 for the June series. Overall, it looks like July series could be range bound between 5558 and 5750 levels. The PCR is at 1.22 which is a bullish sign. The Implied volatility of calls (15.2) is less when compared to that of puts (18.4) which also points to mild bullish move. 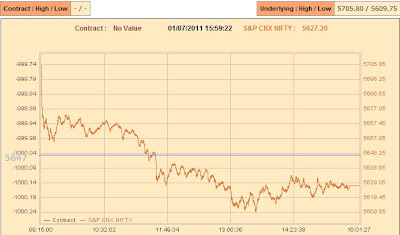 After a non-stop rally of almost eight consecutive sessions, Nifty halted yesterday. The key levels remain the same. Nifty last week after testing 6069 levels lost significantly and closed the week at 5857 levels after gaining more than 1.5% on friday. Options saw hectic action during last week with 6000 calls adding on to more than 13 lakhs in OI and also unwinding to the tune of 11 lakhs on friday. A huge built up was seen in near strike puts of 5800 and 5700 with calls unwinding. PCR has reduced to 0.92 which is favouring bulls to some extent. Market is likely to remain range bound with bulls and bears alternating each day for this week also. 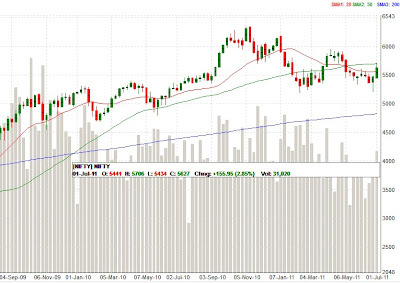 There might not be a strong breakout either side during this week. A retest of low levels around 5685 would be a buy at this stage. Nifty had a good run up last week, gaining whatever was lost the previous week and now has reached a neutral level from where it is likely to consolidate before another move. Options data saw huge increase in OI in all the near strike puts. With PCR remaining at 1.26, overall markets is showing bullish bias. The immediate resistance is around 6080 and on a break of that Nifty can move up to 6150 levels. It is likely to hover in the range of 5885 to 6150. Bulls pushed markets to an all time high close…Will it sustain ? Nifty made a strong up move last week with a gain of 4.9% and closed the week above 6300 levels at an all time high close of 6312. Pattern-wise bulls have established a strong upperhand after a consolidation of around 4 weeks in the range of 6000 to 6200 levels. The build up in options data is increasing steadily with increase seen in both near strike puts and calls. 6500 calls and 6000 puts are ruling above 60 lakhs of OI. The PCR value is 1.38 which is favouring the bulls to a good extent for another rally and implied volatility in near out of the money calls has reduced when compared to puts which again favours bulls to some extent. The extrapolated target level for Nifty is 6366 and it is likely that markets can test the level in the near term. There might also be another strong up move beyond that based on how the options data turn out to be. 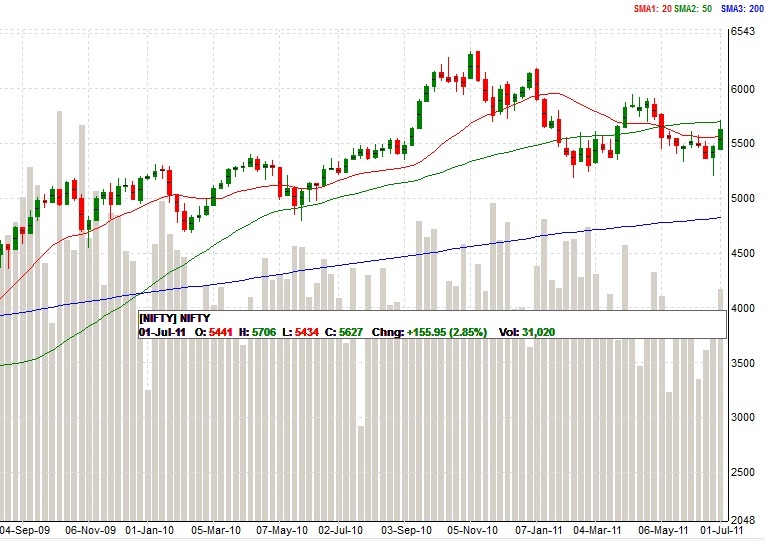 Nifty started on a week note last week and was trading below the 20 DMA for major part of the week. It closed the week on a neutral note at 6066. The sharp recovery which was seen on Monday as well as Thursday has given a false bullish undertone and with premium ruling around 40 pts plus throughout the month has also strengthened the view for the bulls. On friday, both 6100 calls and 6200 calls saw hefty activity with large accumulation of over 11 lakhs and 12 lakhs and 6200 call is having the highest OI for the month. On the other hand not much of activity was seen on the put side. Overall it looks like bears might be able to push markets below 6000 mark and might even be able to break the 5962 barrier and go for a test of 5885 levels momentarily during the expiry week before Nifty can recover and trade closer to 6000 levels. 6125 has been established as a strong resistance and it is not expected for markets to move above that for this series. 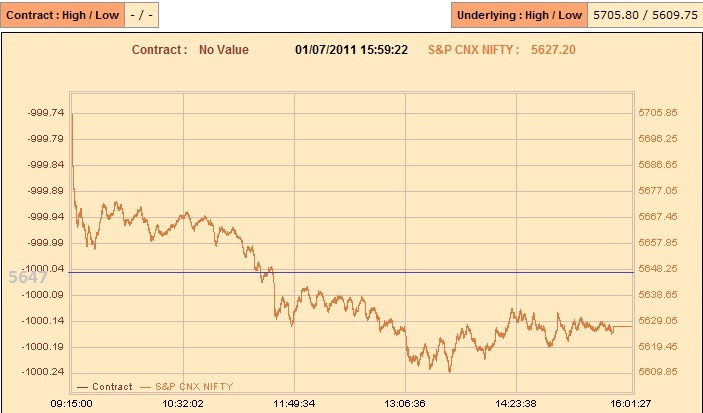 Nifty last week was confined to a range and lost in the last two sessions of the week whatever was gained on wednesday. It closed the week at 6063 levels. The PCR ratio is at 0.98 which is neutral and large increase in OI was seen in 6100, 6200 and 6300 calls as well as in 6000 puts. Even if there is a break of 6000 levels for the week, market is likely to recover and move towards 6200 levels towards the expiry and might remain range bound.